Intern. 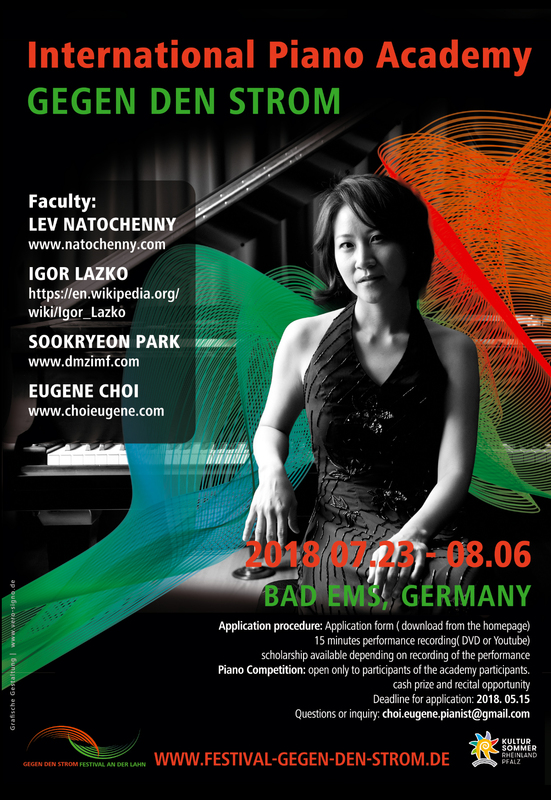 PIANO ACADEMY "Gegen den Strom"
The event will take place in beautiful Bad Ems, Rhineland-Palatinate, Germany, on the river Lahn, as part of the highly popular cultural festival "Gegen den Strom". The very name of this festival, "against the flow", as opposed to “going with the flow” carries an energy in and of itself that is hard to overestimate. Rejection of clichés and commercialism, substituted by emphasis on the highest ideals of art and music, culminate in a resurrection of the XIX century Schumann idea of Davidsbündler (League of David, referring to the Biblical King David) against the Philistines. The goal of this academy is to assist and support exceptionally talented young artists and to provide them with such skill as to offset the banality, cliché and empty virtuosity of superficially theatrical performances. A small number of talented and aspiring young musicians from around the world will be selected by application, and given the opportunity to participate in a 3 week-long intensive course of master classes, concerts, competition, discussions and concentrated individual work. Selected participants will be granted partial or full scholarship based on their application. During the course of the academy, participants will receive hands-on guidance and musical inspiration from the world-renowned professors Lev Natochenny, Eugene Choi and guest professors which will help them develop into mature musicians and exceptional performing artists. Each participant will receive 5 individual lessons/master classes, will enjoy young artists concerts and listen to guest artists. Each participant is entitled to take part in the Gegen den Strom piano competition and winner's concerts. Unlike most summer music “camps”/festivals, where students usually receive instruction from only one designated professor, students of the International Piano Academy “Gegen den Strom” will take lessons from ALL professors. This encourages students to experience a broader and more diverse approach to music in a short time span. All lessons are open to the public (conducted in a master class format) and all students are encouraged to attend other participants' lessons to augment and capitalize on the learning process. The 3 winners of the “Gegen den Strom Piano Competition” will receive cash prizes and will be presented in a winner's concert at the end of the festival. The purpose of this competition is to provide young artists with an opportunity to hear their colleagues, with stage experience in live winner's concerts, as well as to attract media attention to the performances and concerts of the winners. In the process of learning more about music and the instrument, students will also learn more about themselves, their abilities, likes and dislikes as well as personality preferences.